The Moray Button Pack is intended to make it easy to build your own buttons and mix and match features. Follow the directions on how to make use of our buttons on your own site. You may use the whole CSS file in your site, or copy and paste the specific buttons you want. This is inteded for people with little or no CSS knowledge but we wont shy away any advanced users. There are THREE main button ID types, they are named; moray, murry, and marmalade. From here, you can select either a plain button, radient button, glossy buttons or transition buttons. Once that has been determined, you are able to add more features to the button such as text shadow, box shadow, rounded corners, glow and a dip. Go to the Instructions page for more information on the buttons and to download. Or download version 1.1 here. 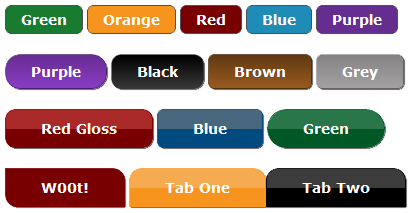 Version 1.1 Update: Tweaked gloss-buttons.